Twenty students shared their internship experience at the first CNY Internship Showcase, hosted by the Central New York Career Development Association (CNYCDA) on November 10. Students from 11 CNY institutions were eligible to apply, and Cazenovia College was one of six schools represented at the event. Cazenovia College faculty members embrace a culture of lifelong learning that allows them to stay current in their field. This attitude and the strength of Cazenovia's alumni network shaped Equine Business Management Associate Professor and Head Equestrian Team Coach Amy Sherrick-von Schiller's summer break. Maureen Louis, professor of communication studies, was recognized by her peers with the Neil Postman Award for Outstanding Teaching and Mentorship at the annual New York State Communication Association (NYSCA) conference in October. 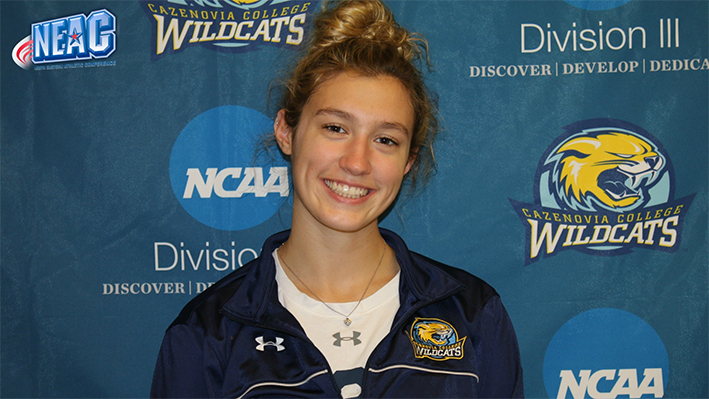 Meet Jenni Uplinger, a senior Photography major from Windsor, NY, and learn what she enjoys about being a Cazenovia College athlete. Meet Dr. Warren Olin-Ammentorp, English Professor and Program Director at Cazenovia College. Olin-Ammentorp is dedicated to helping students explore their interests. Meet Heather Whalen Smith, the director of the Witherill Library located on the campus of Cazenovia College. Whalen Smith helps direct students towards academic sources. Cazenovia College alumna Elisa Therrien '13 used her equine business management degree and experience as a member of the Cazenovia College Equestrian Team to pursue her passion in the equestrian industry after graduation. The North Eastern Athletic Conference (NEAC) announced Meehan Earns as their Student-Athlete of the Week in women's swimming and diving for the week ending December 2. The Cazenovia College Equestrian (CCET) Dressage riders traveled to Centenary University on Saturday, November 10, earning Reserve Champion Team honors finishing with 11 points. Art Gallery in Reisman Hall Presented "Boundaries, Edges, Light & Frame"
The Cazenovia College's Art Gallery in Reisman Hall presented "Boundaries, Edges, Light & Frame", the works of twelve photographers from the collection of Light Work in Syracuse. The exhibition ran from October 25 to December 4. The Fall Management Day included Business & Management internship displays, breakout sessions on the various Management specializations, and networking opportunities with students and business industry guests.